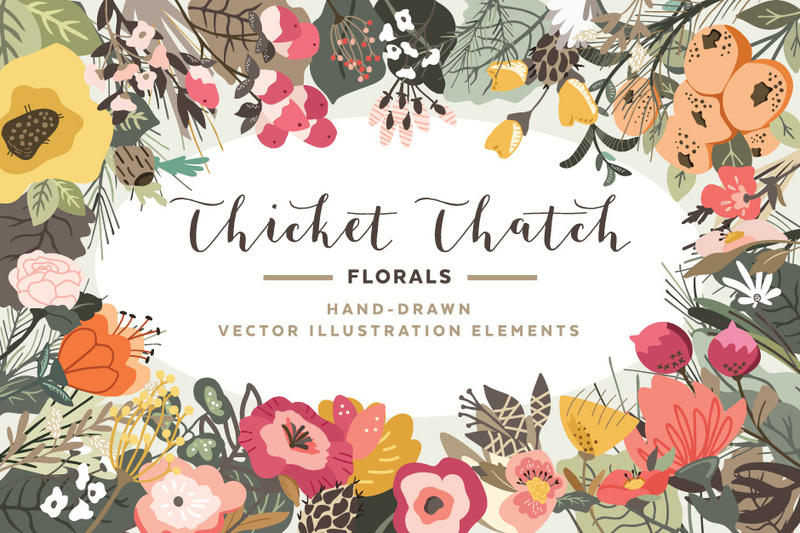 The Thicket Thatch Woodland Florals illustrated graphics pack was inspired by the mountains, and the wonder and adventure found in the thicket of the forest. With over 100+ hand-drawn illustrations, you can share the story of an adventure on any products you dream up! Combine and use the elements for branding, art prints, mugs, t-shirts, wedding invitations, cards, packaging, and more. Software compatibility: Adobe Photoshop and Illustrator CS3 and newer. .JPG and .PNG files will work with most graphic software. File size is approx 54MB (89MB unzipped), offered as a single download. Lovely set. Thanks so much for this week’s free design. Thank you so much!! Very like it. Beautiful flowers & branches. And I LOVE the rustic elements. <3 Thank you very much. You’re so welcome Melissa, thank you for taking the time to leave us such a lovely comment! Thanks, thanks & many thanks!!! So generous, always, and always pro-quality art and fonts! Fridaylujah! LOVE THESE! Denise Anne and DC, you just just Made. My. Friday. Truly. I was having a rather bad day, and these lovely lovey florals and cute lil woodland critters totally just made me smile like a loon. So thank you!!! Can’t wait to play with these, and I really adore the promo image of the stationary with monogram and border…. you just inspired me, bigtime, for hand crafted holiday gifts. Thank you so much for these lovely Woodland Florals! So many fabulous products that can be created using all these goodies. You are so welcome Trina, we hope they make an excellent addition to your collection! Best graphic package I’ve seen here. So graceful and well-proportioned, harmonious colors, really beautiful! Wow, that’s so lovely Richard thank you, we really appreciate the kind words and support! Thank you Denise Anne and DC for your generosity.. These are so cute. I look forward to playing with these. Yay we’re so glad to hear that you love these Julie, thank you so much for your lovely comment! So pretty! Thank you so much. Thank you so much for your comment and we’re so glad that you love these.